I never realized the importance of wearing comfortable shoes until I got a severe foot condition (warts and verrucas). I had to visit the podiatrist a number of times to seek relief from the excruciating pain. After hearing my routine, he told me that long continuous hours of physical exercise with a flat foot is bad enough. On top of that, wearing uncomfortable shoes was aggravating the pain and causing my feet to swell/bruise up on strenuous days. I had to sleep with a pillow under my feet while I stayed in that job. That was when I realized the importance of comfortable footwear and I started wearing cushioned trainers in my routine. It is a good idea to carry comfortable shoes with us if we really want to wear heels on certain occasions or to work. Unfortunately, in most cases comfort and looks don’t go together. All my gorgeous fancy looking shoes are extremely uncomfortable to wear. My most comfy and expensive pair of Clarks shoes look so school girl-ish that I have never worn it on any occasion. Its only for my dress-down days at work or grocery shopping. Whenever we go hunting for new shoes, we have to remember that it’s our feet that we’re talking about. They would be carrying our weight for the rest of our lives. Good advice would be to compromise and buy footwear which may not be that appealing to the eyes (OK! it needs to be a little appealing) but has to be comfortable to wear. For that its necessary to have proper cushioning and that the size is big enough for our whole foot to fit without any toes bending. Many of us girls have a shoe obsession. We may be able to resist buying clothes or accessories but some shoes are just too irresistible. I really don’t believe in wastage. So its vital for us to invest in a proper home for our footwear so we can easily pick the one we want to wear conveniently. There are many types of shoe organizers available in the market today. We can choose which type suits us best with respect to our space, availability and price limits. We are so lucky we are living in a world where organization materials are available so easily in stores. There are many kinds of shoe organizers which I have personally used in my life. I tried over-the-door shoe rack where all your shoes are hung on one side of the door. Unfortunately, I bought the Argos value-range rack so the experience for me was a disaster. Every time I opened the door, the position of the shoes would change and they would start falling on my head and all over me. Finally, the entire rack fell on me so I gave it away with a headache. We love boots… tall ones, short ones, heeled, flat, ankle boots… all of them. But when it comes to closet space, almost all of us have issues, specially when it comes to tall boots (the sexiest kind). The reason boots are the hardest to organize is because they take up so much space. Also if you don’t keep them properly, their shape gets ruined. Lets see how we can solve this problem. Here are some more hangers which are perfect for hanging boots. If you can get hold of the top two trouser hangers, they hold boots very well. The bottom two are sometimes sold with the boots at the store (if you insist hard enough). 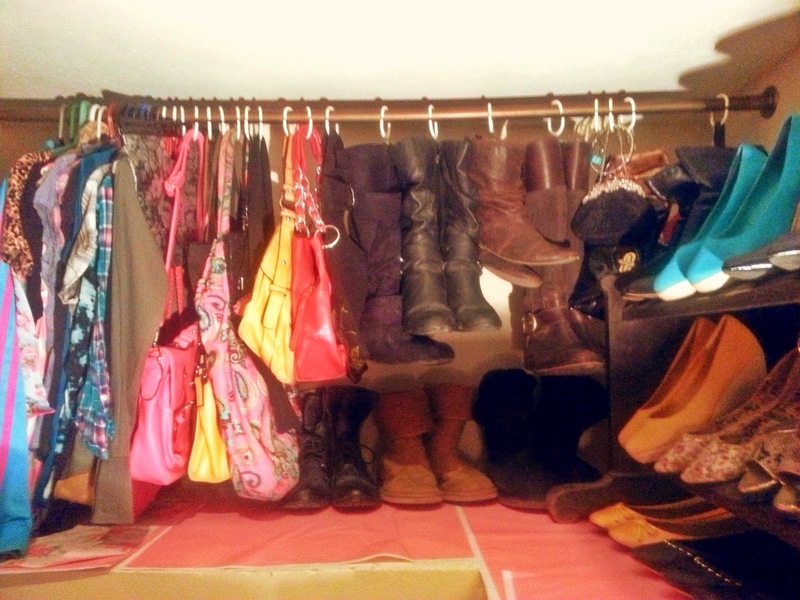 Hanging boots has honestly solved so much of my space issues that its unbelievable. Following are some ways of using the above mentioned hangers. Some shoe trees also come with a hanger on the top. Those would be an excellent investment as shown in the top left picture. I personally like the idea of having all your frequently used items right in front so they’re easy to access. One can find some economical shoe shelves to suit ones need; or even better, think of it as a DIY project where you can address your need by making a customized shoe hanger. I made mine as shown in the following picture. Another idea to save your fancy boots from damage is to put used Pepsi bottles inside them instead of buying expensive Shoe Trees. I use these shower curtain hooks and file clips for boots organization. I simply hang the shower curtain hook on a hanging rod and then insert one metallic side of the paper clip into the shower curtain hook. Now you can hold the boots together and hang them on the paper clip. Surprisingly, a little paperclip can easily hold the weight of even my heaviest Timberlands. Now I can easily hang all my boots without spending a penny. Since my over-the-door-shoe hanger was a flop in my previous apartment, I then bought a canvas shoe organizer for my extra shoes. Since, it was going under the bed, I put all the shoes on top of it as shown in the picture below. I find hanging canvas shelves great to keep accessories such as socks, camisoles and legwarmers. We just have to remember that they cannot hold much weight so just keep it light. It is a good idea to keep out of season accessories like socks and gloves in a shoe box. The best trick is to keep one sock/glove inside the other. We don’t want the singles in search of their soul mates. Following is a picture I found on Pinterest which I found rather funny. I hope this post can be helpful. Any suggestions would be most welcome.